The Sepia Saturday Blog has 'shops' as its theme this week. I thought this would be a good opportunity to show a dozen shop postcards from my collection that I haven't managed to locate. They are all interesting in their own right and deserve to be shown. Click the postcards to enlarge. 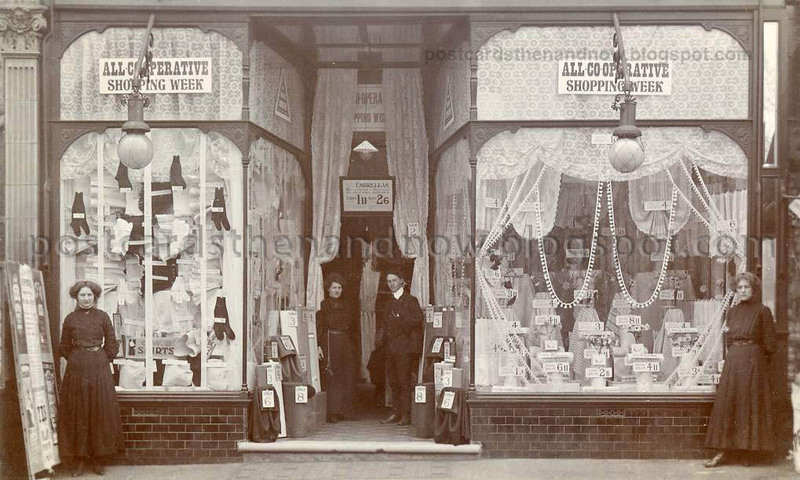 The postcard below is a Co-operative shop selling drapery and womens' clothes. Unknown location. 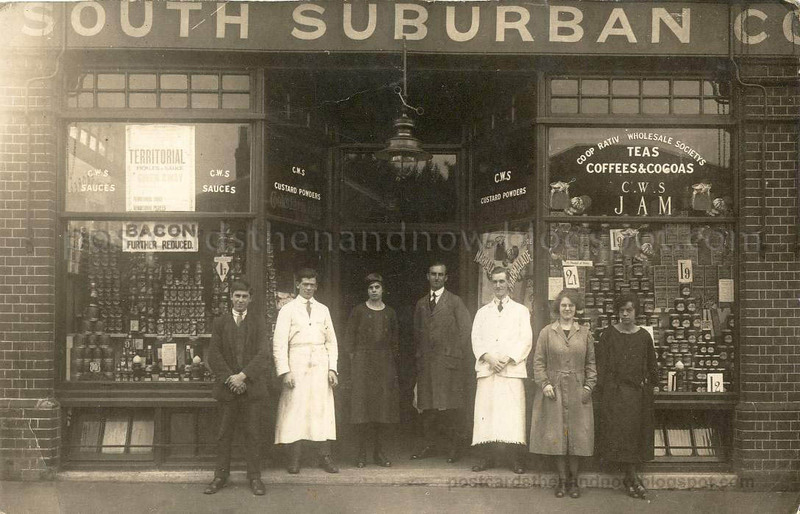 Below - The South Suburban Co-Operative Society. Possibly Croydon area. 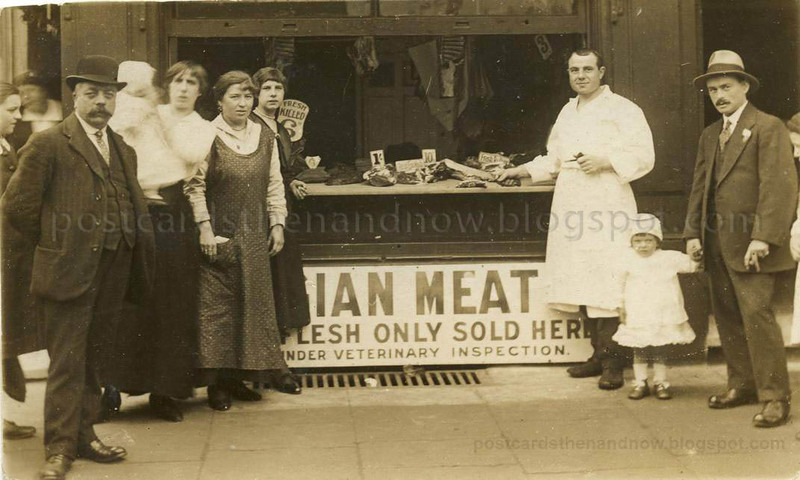 Below - A Belgian Butcher's shop, probably London. 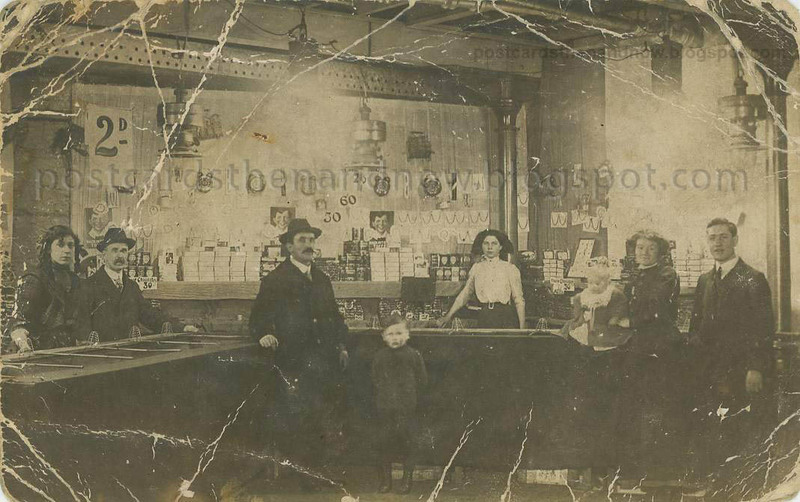 Below - F. Gale, postcard shop. Unknown location. 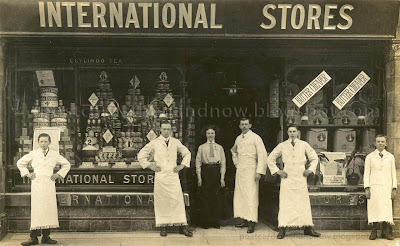 Below - International Stores - unknown location. Below - McGowen Stores - unknown location. 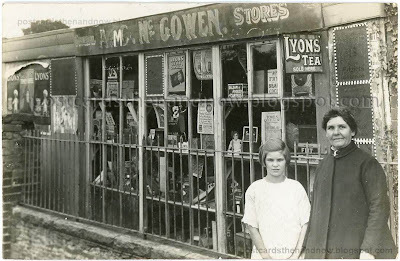 Below - shop or stand at exhibition/fete/fair, Norwood, South London. Below - South Shields, North East England, makeshift stall/amusement/shop at fair. 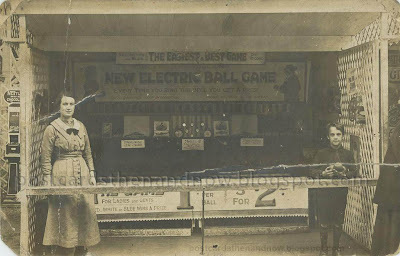 Below - South Shields, North East England, fairground stall (from same collection as above). 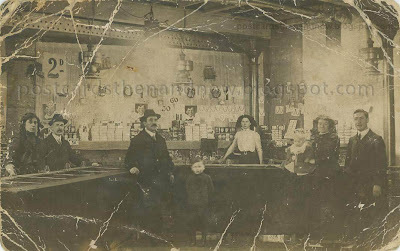 Below - Reading, Berkshire, interior of unknown shop. Below - West End of London - Interior of Peter Robinsons Department Store, showing the kind of service wealthy ladies could expect. Wonderful! The 2 women in the first co-op photo look like bookends. 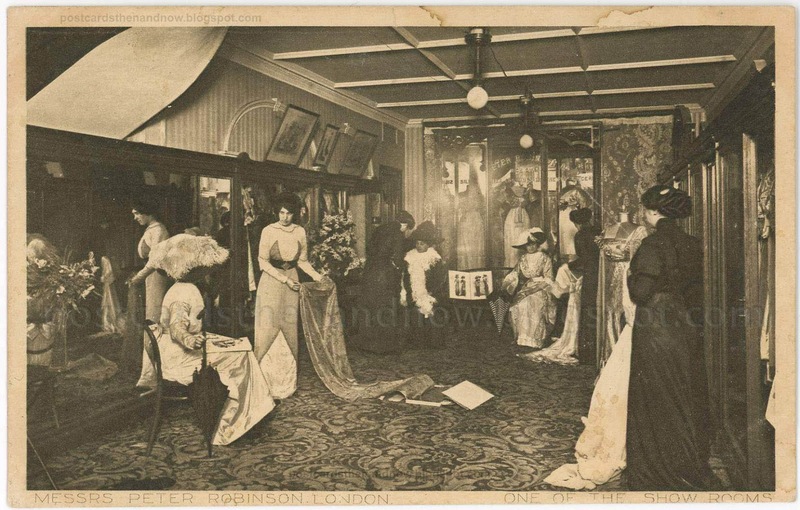 My favorite photo is the fine department store for ladies - I'm sure I've never seen anything like that one. Overall, the store fronts remind me of the downtown where I grew up. All the stores had those big front windows and set-back door. Cool postcards! 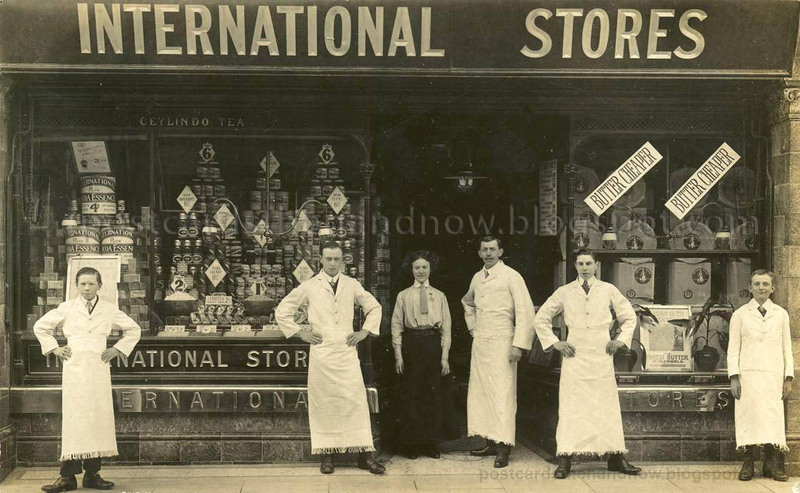 The young men on each end in the second International Store postcard look so young! 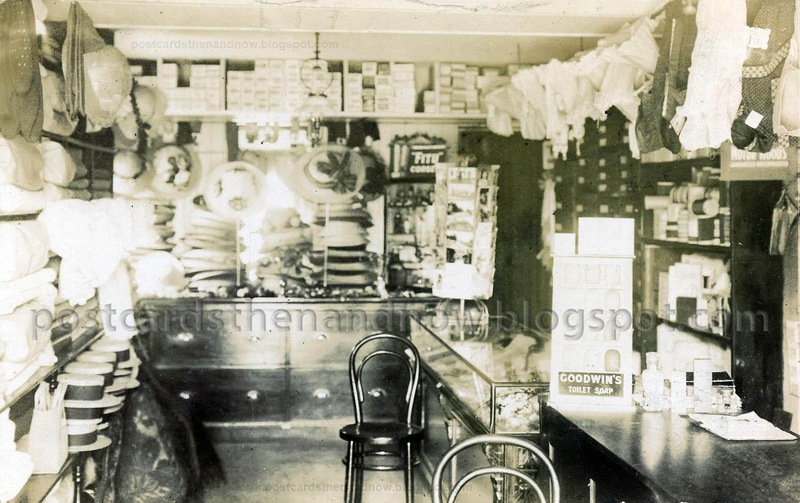 The second to last postcard looks like a hat store. Interesting to see all those banded straw hats on the shelf. And yes, the last postcard looks like a very elegant place indeed! What a great collection of postcards! When you enlarge them, there are so many details to see. Wish I could find my magnifying glass I'd like to get a better look at all of them, especially the first photo. It's always interesting to identify the brand names of products they were selling and also the prices. The young man on the left of the first International Stores card could have been Glanville whose job was to make the deliveries on the bike on the right. But then it's much too big a shop to be 'Open All Hours' in those days. For many of them I kept thinking "I recognise that". 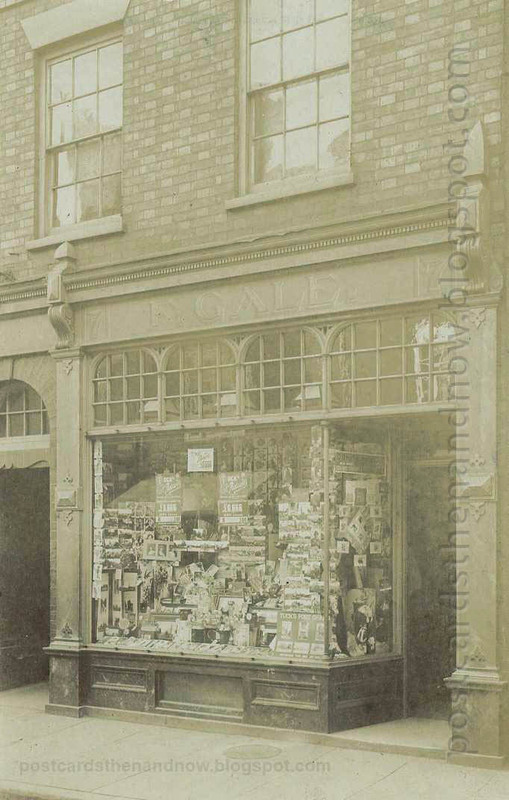 But perhaps most old shops look alike. Nice collection. One could linger over the details for hours. Good luck with the detective work. Clearly the winning post for this weekend's theme, Howard! The shops' exterior decoration and window displays are fascinating when you consider how stores competed with marketing on the High Streets. The interior photos are even better for showing how the shopping experience has changed. It is so rare today to actually know a shop keeper proprietor. what a fantastic collection. I just love all the detail that there is to see. I would so love to be able to time travel back, just to have a look and meet a few people :). Wow! Great choices. I enjoyed enlarging them to see the details. That last one is quiet something ... was the woman on the left wearing a whole animal, lol? 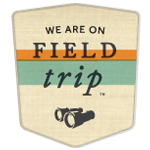 A great collection of photos. I love the ones which show the staff outside and as my husband is from South Shields, these were of particular interest. A collection that has me bright green with envy! Beautiful collection. Thanks for sharing them. 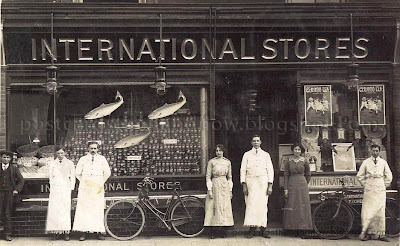 I'd very much like to step into one of those International stores for a few moments. I have a feeling they would reject my credit card though. 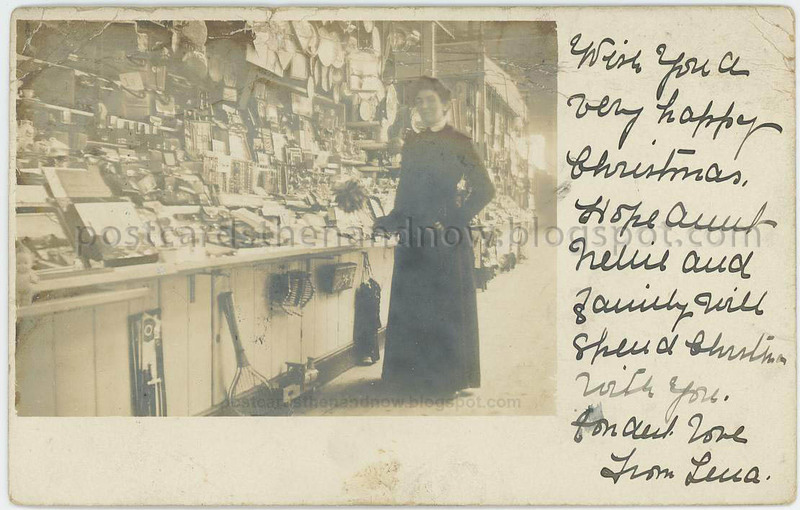 Hi Colin, one of the postcards has modern writing on the back which states 'A shop my granddad owned in South Shields'.